Be a part of the huge trend among Instagram community! 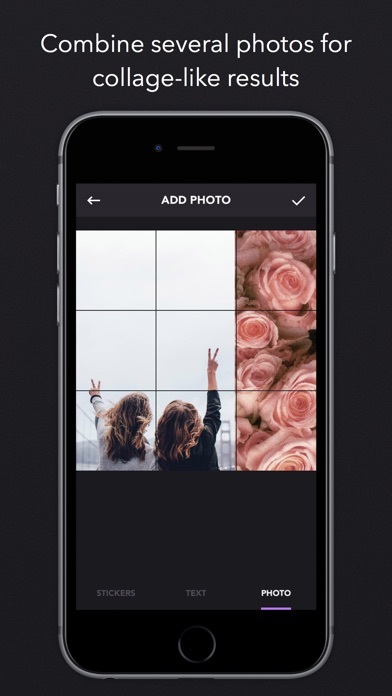 Break your large photos or panoramas into a number of square pics and upload them to Instagram to awe your friends and impress your profile page visitors! Watch separate tiles combine into one mind blowing image allowing for unparalleled level of detailing and flexible scaling options. Be it a casual self shot, a city skyline or a mountain landscape, with Grids Pro they will look amazing on your profile page. You won't have to shrink or resize your creations ever again! Take a new picture right from within the app or upload an existing one from your Library, choose a suitable sizing option among the 33 available options, and let Grids Pro crop the image for you! 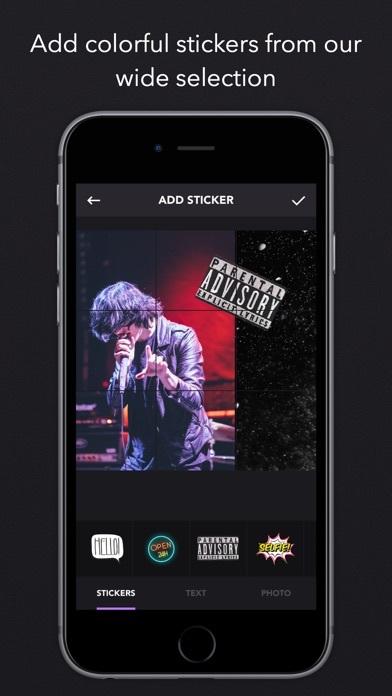 All you have to do is to submit the resulting pics to your Instagram in the order suggested by the app. 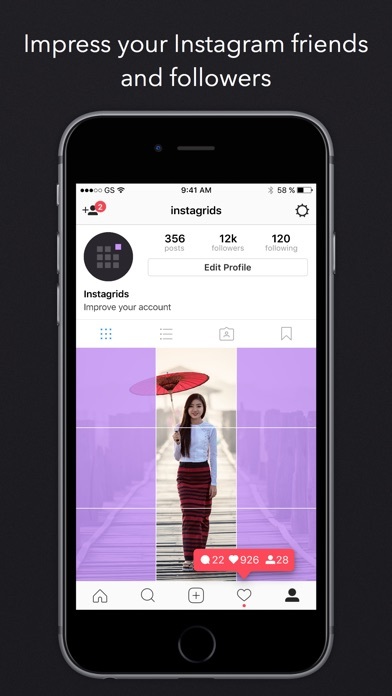 You don't even have to save the tiles to your device as sharing to Instagram is embedded in the application! With the latest version of the app you are not limited to solid grids with three rows. Choose one of the more intricate styles with the possibility to substitute certain squares with color for amazing results! 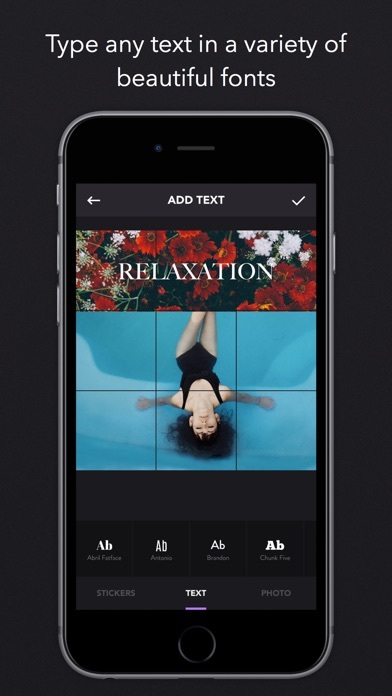 Combine two and more photos in one grid for collage like effect. Express yourself through our vast collection of stickers or add text in a variety of beautiful fonts! 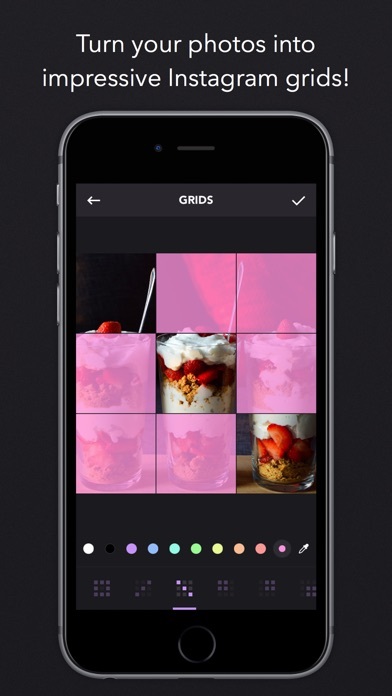 Grids Pro introduces a totally new way of using your Instagram, wrapped in simple and beautiful design. Don't miss the chance to express yourself by embellishing your profile page and posting breathtaking large scale images in their full glory! Couldn’t open the app! Waste money! Would love it even more if I could just split a photo in two. But it’s easy to use and totally worth it. Still messing around with it a little. It’s seems good though.